Britain First, which aims to “take our country back,” is a neo-fascist, anti-immigration and “anti-Islamification” group founded in 2011 by Jim Dowson, a former British National Party employee. The embarrassing connection comes just days after it was revealed UKIP has lost a quarter of its support since November. Analysis from polling group YouGov showed the party had lost one in four voters over the last five months and support has fallen from an average of 16.75 percent in November last year to 12.25 percent by the end of March. 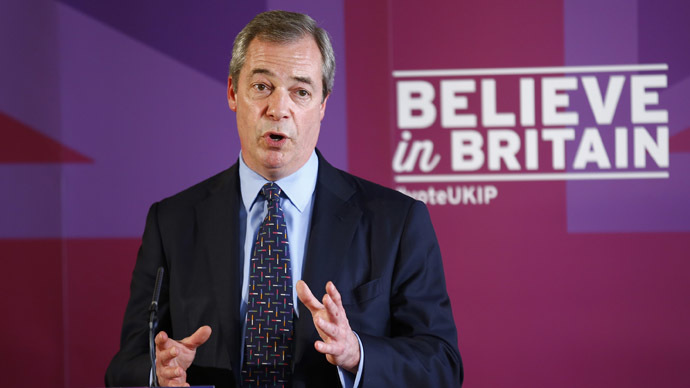 UKIP leader Nigel Farage conceded his party had “slipped back a bit” in the polls since the autumn surge of popularity fueled by its by-election successes in Clacton and Rochester. The news followed Prime Minister David Cameron’s plea to UKIP voters to “come home” to the Conservative Party to help prevent Labour Party leader Ed Miliband coming to office. Its alleged links with UKIP come a week after Britain First members clashed with Muslims outside the London Central Mosque, where supporters of radical Islamist preacher Anjem Choudary were handing out leaflets urging Muslims not to vote. Britain First joined with another far-right group, the English Defence League (EDL), to stage their protest, where members provocatively wore niqab veils and pig head masks as they chanted anti-Islamic slogans. Britain First founder Dowson quit the group in 2014 following what he called “provocative and counter-productive” mosque invasions.